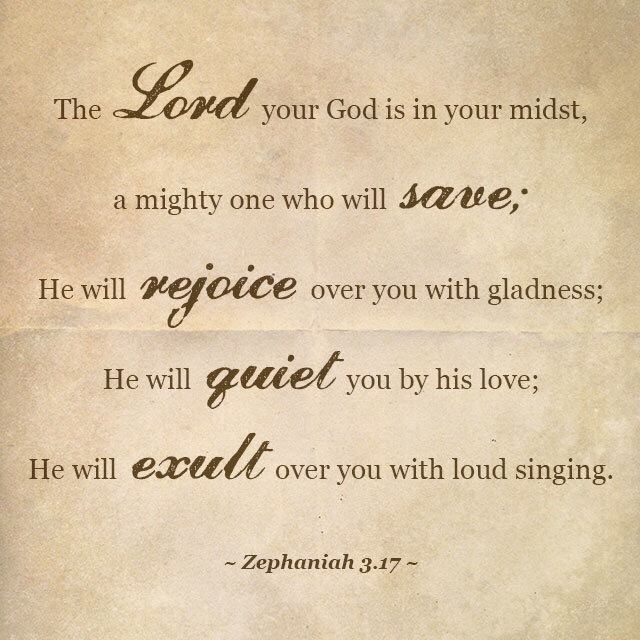 He rejoices over you with singing. In Jesus this verse has been fulfilled. Because of Jesus, I can experience the reality of walking with God every single day. A reality where I am aware of God’s saving power. A reality where I can experience His delight in me. Just the concept of God’s delight for me blows my mind. I don’t delight in me. I wake up with a mental tally of all the things I’m NOT doing right and all the ways I am not loveable. Yet God, who is perfect and holy, delights in me. He lives with me as I do really boring stuff like the laundry. He is singing songs of joy over me as I sort through the monthly bills wondering how we are going to make it. He smiles with me and enjoys all my quirks. This reality CAN be my experience but only if I allow it. If I lift my eyes above my present circumstances and see all the way to heaven. This reality has already been bought and paid for by the blood of Jesus. It is mine as I receive it, as I walk in it, as I think more about what God thinks of me rather than what I think of myself. Can you hear His joyful song over you? Do you know He delights in you today? Have you lifted up your eyes to see your mighty Savior today because He is seeing you.